Limatambo, located 80 km from Cusco, is not part of the 4-days Inca Trail. This little town can be visited in one long day from Cusco. 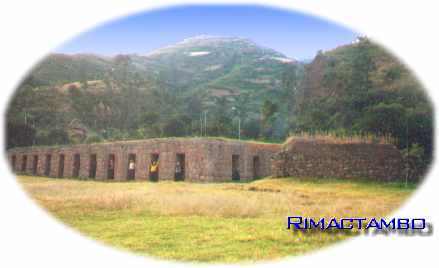 Next to a hacienda called Tarahuasi, there is the Inca ruin Rimactambo. We spend our first night near this little Inca ruin to become current to the altitude. Some of the group arrived the day before in Cusco. It takes two days to overcome the negative effects of the altitude. The ten days trail starts in Mollepata. Rimactambo lodged the runners or chaskis along the Inca Trail north. Big niches are constructed in a polygon wall. The Spanish build next to the ruin a hacienda called Tarahuasi (picture). This colonial building has over 500 years but is in bad condition. There is no money to restore the hacienda in its original state. 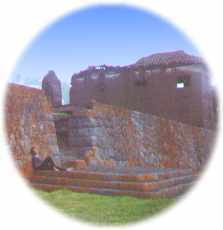 It's occupied by the guard of Rimactambo and can be visited. The field in front of the ruin can be occupied as campsite. People are friendly and some shops are found at the main road. Try to buy some ca�aso (2 soles for half a liter). This is a strong alcoholic drink made of sugar cane and can be helpfull to warm you up during the cold evenings the following days. We got up very early (5 o'clock) because the only bus to our next stop Mollepata passes at 6h30-7h.